The BP Pedestrian Bridge, or simply BP Bridge, is a girder footbridge in the Loop community area of Chicago, Illinois, United States. It spans Columbus Drive to connect Daley Bicentennial Plaza with Millennium Park, both parts of the larger Grant Park. 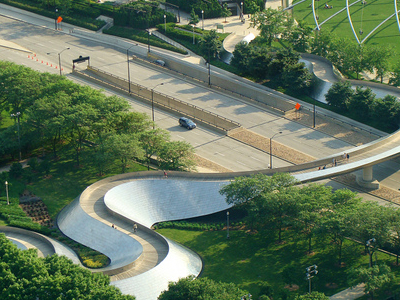 Designed by Pritzker Prize-winning architect Frank Gehry, it opened along with the rest of Millennium Park on July 16, 2004. Gehry had been courted by the city to design the bridge and the neighboring Jay Pritzker Pavilion, and eventually agreed to do so after the Pritzker family funded the Pavilion. Here's the our members favorite photos of "Bridges in Chicago". Upload your photo of BP Pedestrian Bridge!